Paganism, also called Neopaganism, Modern Paganism or Contemporary Paganism, is a recent movement which is a modern take on ancient practices. It is an umbrella term that can include a variety of denominations, traditions, or religious movements. 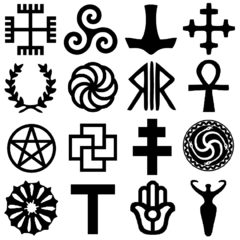 These can include Wicca, Druidry, Norse Heathenry and other Polytheistic Reconstructionist or Traditionalist groups (Celtic, Germanic, Hellenic, Kemetic, Baltic, Slavic), Goddess Religions, Shamanism, Santeria, Voudon/Voodoo, Mystery Traditions, Eclecticism, Esoterism, Occultism, or Ceremonial Magick. Isaac Bonewits describes Paganism in three ways. “Paleopaganism” refers to the original ancient polytheistic, nature-centered faiths of tribal Europe, Africa, Asia, the Americas, and Oceania. These are the non-Christian “country-dweller” pagans that the Romans described on their conquests. “Mesopaganism” describes movements to revive or recreate ancient pagan faiths, however influenced by modern concepts. These include Freemasonry, Druidism, Thelema, Odinism and others. “Neopaganism” is the post-1950s revival of both Paleopagan and Mesopagan movements, first used in the 1960s by Oberon Zell, founder of the Church of All Worlds. However, some feel that using the word “Neo” to describe their religious beliefs disassociates them from their pre-Christian forebearers. Many prefer to use the upper-case “Pagan” to differentiate from the practices of ancient pagans (lower-case), which also acts to reappropriate the word from a previously negative term into a positive and powerful label. Paganism is a religion. Although they may not meet in centralized churches and proselytize their faith, Pagans celebrate their religion like Christians, Muslims or others. Paganism is a modern religion. Although based on ancient practices, festivals and concepts, most Neopagan movements are a recent 20th century development. Paganism has no central hierarchy or dogma. Most Pagans are free to believe what they choose. There is no Pagan ‘bible’. Paganism stresses personal responsibility. Most Pagans believe that they are responsible for their beliefs, their behaviours, and their degree of spiritual development. Paganism offers a different worldview. Paganism combines ideas from science, metaphysics, mysticism and spirituality. Paganism is spirituality. Paganism is a way of living, praying, and connecting to the flow of the universe. Pagans utilize a variety of methods to feel connected to the divine, including ritual work, meditation, prayer, tantra, working with herbs and essential oils, aromatherapy, crystal healing, massage, vision quests, pathworking, journeying, and divination like using tarot cards, runes, pendulums or scrying. The history of Paganism certainly is an interesting topic, and books like The Triumph of the Moon (Hutton) and Drawing Down the Moon (Adler) go into a lot more detail about the history of Paganism, both contemporary and ancient.